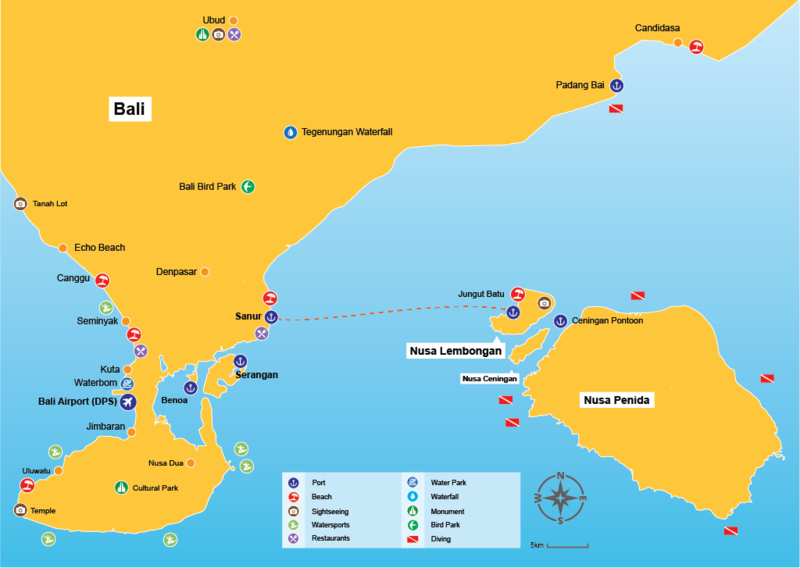 A brand new boat to Lembongan operated by an experienced local team, D' Camel Fast Ferry departs from Sanur beach in south Bali and offers 3 daily trips from Bali to Lembongan. The total crossing time is just 20-30 minutes, arriving in the heart of Lembongan main village on the stunning white beach of its western shore. Free hotel transfers are included from Ubud Central, Sanur, Kuta, Jimbaran, Nusa Dua, Denpasar Airport and Legian (other areas are possible against extra pay). To check availability, prices and book the D'Camel fast ferry to Lembongan please use the search box at the top of this page. You will be sent etickets immediatly after payment and the boat company will email you seperately confirming your trip details and (if applicable) the pickup time from your hotel. D'Camel is a new fast boat carrier with a well built modern boat and experienced local managment who have been in the business for a number of years. Friendly staff and properly trained crew will make the journey fast and comfortable, right up to the picturesque main beach of Lembongan island. Once booked, don't hesitate to use the contact information on your tickets to reach D'Camel with any questions you might have. Departing Sanur Beach*: 09:30, 14:00 and 17:00. Total sailing time: 20 - 30mins. Departing Lembongan: 08:30, 12:30 and 16:00. Sailing time: 20 - 30mins. * Free pickup & drop off is offered from/to many south Bai locations such as Kuta, Legian, Jimbaran, Ubud Central, Sanur and Nusa Dua. Pickup typically takes place around 1hr30mins before departure time. Exact details are emailed after booking when you enter your hotel address in the appropriate field of the booking process.